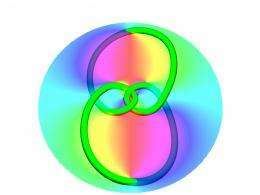 The coloured circle represents the hologram, out of which the knotted optical vortex emerges. 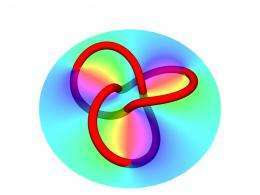 (PhysOrg.com) -- The remarkable feat of tying light in knots has been achieved by a team of physicists working at the universities of Bristol, Glasgow and Southampton, UK, reports a paper in Nature Physics this week. Dr Mark Dennis from the University of Bristol and lead author on the paper, explained: "In a light beam, the flow of light through space is similar to water flowing in a river. Although it often flows in a straight line - out of a torch, laser pointer, etc - light can also flow in whirls and eddies, forming lines in space called 'optical vortices'. Optical vortices can be created with holograms which direct the flow of light. In this work, the team designed holograms using knot theory - a branch of abstract mathematics inspired by knots that occur in shoelaces and rope. Using these specially designed holograms they were able to create knots in optical vortices. More information: Isolated optical vortex knots by Mark R. Dennis1, Robert P. King, Barry Jack, Kevin O'Holleran and Miles J. Padgett. Nature Physics, published online 17 January 2010. I would like to see how these vortices interact with nanocomposite infinite charge carrier ring arrays. Can we tie any analogies together between light vortices and black holes? It's curious, this field of study is absolutely exploding on all levels.